Would you like your pop star costume to stand out a bit more? Are you dressing up as a magical being such as a fairy or pixie? Or maybe you'd like to add a unique touch to your futuristic outfit? Well with just one accessory you can perfect any of these costume ideas! All you need to do is complete your Halloween costume with this Glamourama Neon Purple Wig! No need to worry about trying to find the perfect color and the extra time to dye your hair this year. 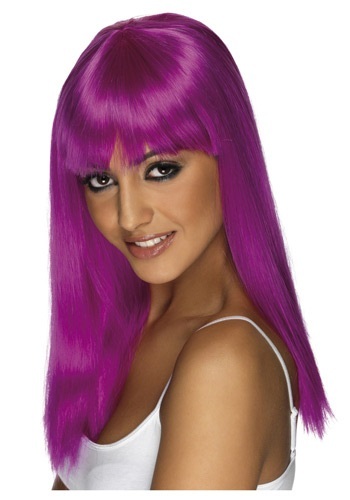 Nope, this glamorous wig will give you the bright vibrant look that you desire! This new purple hairdo will grab everyone's attention when you enter the party scene this holiday! The mesh netting on the interior of the wig will keep this hair piece in place will you go wild on the dance floor, so feel free to head-bang all you want!